-AMAZING ON A WIDE RANGE OF STAINS(SEE REVIEWS):COFFEE, GREASE, PET STAINS AND ODORS, URINE, SUGARY DRINKS, GENERAL GRIME, AND MORE. This formula is effective on most of the common household stains( NOT COLOR DYE STAINS). It is also fantastic for Car, Automotive and very dirty carpets. -FREE CARPET STAIN REMOVAL GUIDE : Peter MacDonald has written a Stain Removal Guide to help you plan your way to remove those common stains. -CONCENTRATED SECRET FORMULA: GREAT VALUE FOR MONEY, No need to use a lot of product on the stain, designed for home use, and it dries quickly. -AMAZING!!! CLEAN THE STAIN OFF ONCE: NO STICKY RESIDUE - NO REAPPEARING STAINS. Uses amazing encapsulation technology that traps the dirt in the secret non stick formula when it dries, there is NO STICKY RESIDUE. The stain will not come back due to a sticky residue. -TESTED AND ENDORSED BY A PROFESSIONAL CARPET CLEANER : Peter MacDonald the Founder of VeryDirtyCarpets has 20 years experience in Carpet and Upholstery Cleaning. "We searched the world to find the "Best" Formulation that fitted our requirements to give our customers "The Best". We found this outstanding product and we offer it to you with 100% MONEY BACK GUARANTEE. Made in the USA. The formulation was developed by one of the USA's top carpet cleaning products developmental laboratories and it is great at most stains in the carpet like oils, food stains, sugary foods, and fresh animal stains . It is not designed for color based stains like cordials and food dyes or set urine stains. Please note that this product is a great general cleaning product, although people have had success with some color stains we don't claim that it will remove color stains. It has no bleaching products in its formula. 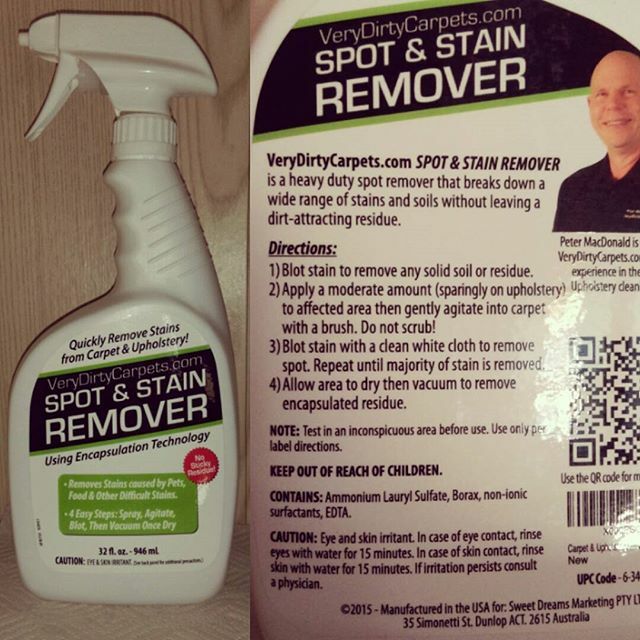 I have used all sorts of carpet stain removers in my day. So many claim to do all these wondrous things, yet very few hold up to that reputation. I have to say that I was honestly shocked at how well this product performed! I have a home with 20 year old carpets, and pets. So between foot traffic, and all the messes that pets can make, my carpets have been through it all. I had a few stains on my carpets that were old, and I had 2 that were fresh. I followed the directions on the bottle, and sprayed this on them. After drying and vacuuming, I was shocked at how well this had worked. On the fresh stains, it was as if they had never existed. With the old stains, it brought my carpet back to its original color! I now go around the house looking for old stains other products couldn't touch, and use this on them! I have also recommended it to my friends and family who have pets because this stuff is a life saver! I absolutely have no negatives about this, I truly love this!